Wind turbines don’t respond quickly to islanding situations (e.g. 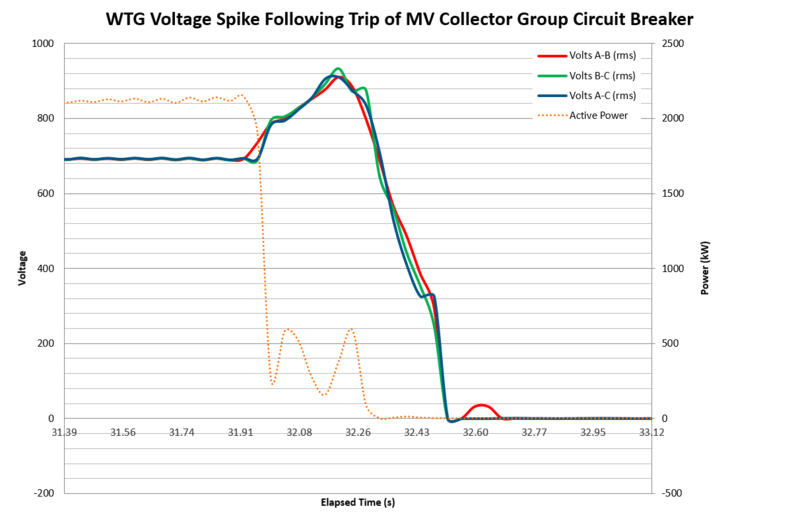 tripping of a medium voltage collector group). They may detect islanding quickly, but it is typically quite slow for a brake program to initiate and the generator to be isolated from the grid. Between the time the wind farm (or turbine string) has become islanded and the time that each turbine isolates itself from the islanded network (usually via opening a contactor, not tripping a CB as many people believe), the turbine terminal voltage rises significantly. If an earth fault is present on the wind farm MV network (e.g. MV cable joint fault, a common cause of collector group trips and thus WTG islanding), then the two un-faulted phases will already be experiencing increased voltage (for explanation see this article on neutral earthing and how voltages are affected during faults). So the combined voltage increase due to islanding and an earth fault can be quite significant. For this reason MV surge arrestor selection needs to be performed carefully. Ensure the maximum continous operating voltage (MCOV) of the surge arrestor is greater than the voltage seen under a combined islanding/earth-fault situation. Otherwise surge arrestors will fail if an earth fault occurs during a period of high WTG generation. Surge arrestors are not designed to dissipate power-frequency overvoltages. At the same time, it must be kept in mind that the level of protection afforded to the device that the surge arrestor is protecting (e.g. cable, switchboard, transformer) decreases as the voltage of the surge arrestor increases. Failed 33 kV White-phase surge arrestor. Photo is taken from underneath the switchroom looking up into the switchboard after gland plate removal. The incoming cables are connected to a wind turbine collector group. Note that with the gland plate installed, there is nowhere for the gas produced during surge arrestor failure to vent. The gland plate should be fitted in a manner that allows venting underneath the switchroom. Otherwise you are likely to dump the (expensive) switchroom fire-supression gas and risk damage to the switchboard. If your wind turbines have been islanded before, examine your SCADA system’s event logs. See if a high speed capture was triggered on the last islanding event. Triggering should be standard on modern wind turbine SCADA systems. The log is usually called something like a fastlog, high-speed capture, snapshot etc. Voltage is one of the signals that is sampled during the high speed data record. Examine the extent of the islanding overvoltage at the turbine terminals. Consider how this will translate to voltage on your MV network. You should be able to conclude whether your surge arrestors are adequately rated when islanding coincides with an earth fault. Another source of this data could be your MV feeder protection oscillography but that might require you to physically plug in to the protection relay to download it. Islanding overvoltage is a particularly important consideration when surge arrestors are located inside an MV switchboard rather than at UG/OH transitions. If the wind farm substation contains no overhead line or outdoor switchgear, the switchboard may be the only suitable installation location. Surge arrestors mounted inside switchboards are usually able to dissipate less energy than overhead line surge arrestors. In addition to their lower energy capacity, there is a risk of damaging the surrounding switchboard when the surge arrestor ruptures. If your wind farm has an islanding event, it might pay to visually check the surge arrestors before re-energisation. Even if no surge arrestors were damaged, check your wind farm SCADA system (including wind turbine fastlogs). This could alert you to potential future problems. ABB produce a great document on surge arrestor selection which I have found very useful. It can be downloaded from ABB’s website. Update April 2016: It is becoming more common for people to install a grounding transformer at the end of each collector group. Grounding transformers are intended to control the overoltages caused by islanding during an earth fault. 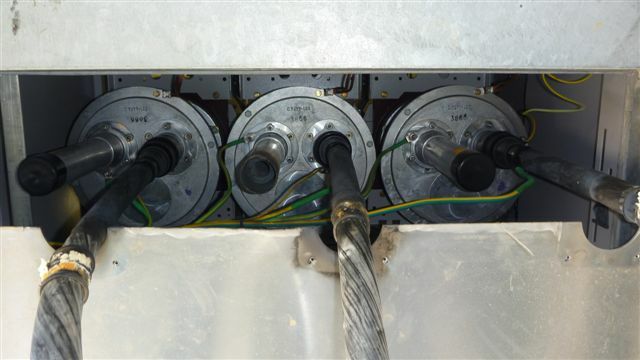 Here is a good article on the application of grounding transformers at wind farms. High speed earth switches are another option which apparently earth the faulted feeder within 1 cycle of the trip.